After saving the world, Percy Jackson (Logan Lerman) now lives in a camp for half-bloods, run by Dionysus (Stanley Tucci) and Chiron (Anthony Head). The camp is protected by a force field that only allows offspring of the gods in. There are competitions among the deity spawn to determine who is the best. Percy’s greatest competition is Clarisse (Leven Rambin), the daughter of Ares. Percy’s downfall is that he is more concerned with helping others than decidedly winning the competition. Percy is distraught that his father, Poseidon, never seems to help him or even give him fatherly advice. After one attempt, Poseidon sends a son no one previously knew about to the camp. Tyson (Douglas Smith) is the spawn of a god and a sea-nymph, resulting in a cyclops. He’s a little rougher around the edges than the others in the camp, and isn’t well received. Luke Jake Abel), who Percy defeated in the original movie, has survived, unbeknownst to all, and is looking for revenge. Partly against Percy, partly against his father, Hermes (Nathan FIllion). He destroys the force field around the camp to send a message. He tells Percy that he is looking to rebel against the gods and has several others with him. He tries to convince Percy to join him. With the destruction of the force field, a tree that has grown from where Thalia (Paloma Kwiatkowski), who gave her life protecting others from a cyclops, including Luke, is now dying. (Which is why Tyson is shunned.) Annabeth (Alexandra Daddario) comes up with a possible solution. If they can retrieve Golden Fleece, with it’s magical healing power, they could put it on the tree to save it. The Golden Fleece must be retrieved by a half-blood, using a satyr to guide them, as satyrs are naturally drawn to the Golden Fleece. No satyr has ever survived the quest, as it is guarded by a cyclops, who eat satyrs. Clarisse is sent on the quest, leaving Percy and his friends behind. 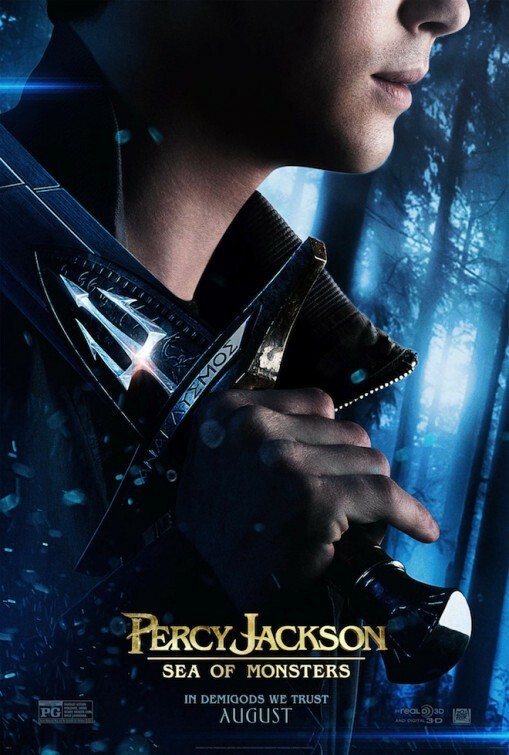 When Percy learns there is a prophecy that the offspring of one of the elder gods (Zeus, Poseidon and Hades) will grapple for the Golden Fleece and either save or destroy Olympus, he decides to take Annabeth and Grover (Brandon T. Jackson), a satyr, to retrieve the Golden Fleece. They must retrieve the Golden Fleece before Luke can get to it and follow through with his plan to resurrect Kronos (Robert Knepper), father of the gods, to destroy Olympus. While watching this, I was again wishing I had rewatched the original before undertaking the second episode. I realized that the reason I was completely lost is that I had never watched the first movie. Luckily, most of the parts that are essential to the plot are spelled out to a degree. Enough that you can get through Sea of Monsters (named for where the Golden Fleece resides). The Percy Jackson series, written by Rick Riordan, seem to be aimed at getting teens into Greek mythology. A pseudo Cliffs Notes, if you will. When Percy finds out there is a prophecy involving him, he goes to the Oracle of Delphi, which is oddly reminiscent of Zoltar from Big. While retelling the prophecy, they give you a full recap of Greek mythology, which is helpful if you don’t remember much from high school. It brings you up to speed enough to know who the major players are and why they are important. The acting and action are on par with what you would expect from a mythology movie aimed at teens. The action is intense enough to get the point across without overwhelming. The story gets a little dark at times, but overall, it is light enough so it doesn’t get too bad. The CGI and special effects, again, pretty much on the level you would expect from a film like this. They are a couple of steps above being the cheesy type you grew up with, think of the original 1981 Clash of the Titans, but not in the same league as the 2010 remake of the same movie. Overall, it’s definitely not a bad movie. If you have middle school kids and are looking for something to keep them interested, and maybe give them a little boost for when they get into mythology, Percy Jackson will do the trick. Mine definitely enjoyed it. And it was better than sitting through an animated retelling of the same story that just uses a different mode of transportation. Or so I’m told.